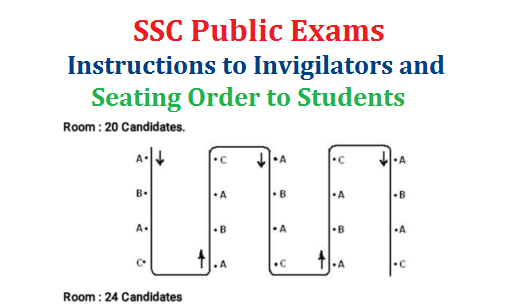 TS SSC/10th Public Exams Instructions to Invigilators and Seating Order for Students Instructions on Conducting SSC Public Examination to invigilators about their job chart at the centre These instructions are divided into two Parts. Part-Ideals with General Instructions applicable to all papers. TS SSC/10th Public Examinations March 23017 Instructions to Invigilators Download | Read all the Instruction scarefully and incase of any doubt,please discuss with the Chief Superintendent and the Departmental Officer. Any lapse on his/her part wil lcaus eirrevocable damage to the candidates. APPOINTMENT ORDER REPORTING FOR DUTY. RECEIPT OF QUESTION PAPERS: ts-ssc-10th-public-examinations-march-instructions-to-invigilators-download The Invigilators are informed that Codingis being implemented for all the subjects of SSC,OSSC and Vocational Public Examinations,March,2017also.Detailed instructions to be followed while conducting examinations are given in the Part- II of these instructions.Any deviation/mistake /lapse on the partofthe invigilator will lead to severe consequences such as with hold in the results of the candidates in his room,non identification of the answerscripts of the candidate and severe disciplinary action against the invigilator concerned.